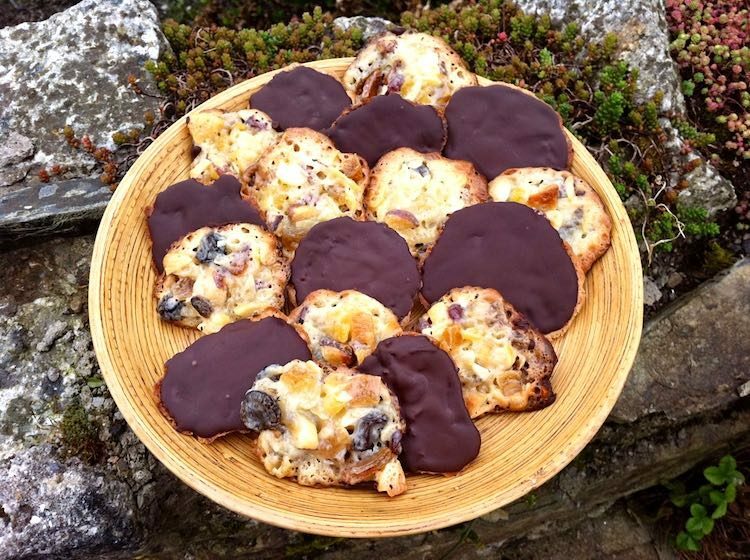 Of all the food blogging challenges out there, Random Recipes from the delightful Dom of Belleau Kitchen is my absolute favourite – excluding We Should Cocoa, of course. I love the way it makes me discover new recipes or cook something I might never normally get around to or even think I want to make. I’ve been unable to participate in the last two challenges and this has left me feeling somewhat bereft. However, it’s a new year and I am determined to apply myself more effectively. This month, it’s a new year, a new book, in other words we’re to pick a random recipe from our newest book or in my case books. I had two food books given to me for Christmas this year: Tea with Bea and Cooking with Chocolate. I was very happy to have either of these picked. CT did the honours and it turned out to be Tea with Bea. Page 63, CT announced when I asked him to pick a number. At this point, my heart sank a little, page 63 was the chapter heading for tarts, but pastry really isn’t my forte. Well, I mused, I can’t very well make a chapter heading, I’ll get CT to pick another number. Feeling my resolve weakening, I gave myself a stern talking to and went for the first tart that involved chocolate. This was the ultimate coconut cream pie and not only did it sound superb, but it didn’t involve pastry – yeah! Smashed up 400g of digestive biscuits in a large mixing bowl with the end of a rolling pin. Melted 100g unsalted butter. Bea had stated somewhere between 75g and 100g would be needed, but I was rather dubious how such a little amount would stick the biscuit crumbs together. My normal recipe is for half the butter to biscuit, so in this case would expect 200g butter. But, I thought I’d try it and hoped for the best. Stirred the butter into the biscuits and divided the mixture into two tart cases (I didn’t have the recommended 23cm pie dish). Pressed the crumbs as best I could into the bottom and sides of the dishes. Baked for 15 minutes at 150C then left to cool. The instructions for the coconut pastry cream were overly complicated, so I ignored them and used a standard custard method instead. Whisked 2 eggs yolks with 3 tbsp vanilla sugar (caster sugar) and 1 heaped tbsp custard powder until well incorporated ( should have added 1 tsp coconut extract, but I didn’t have any). Brought 250ml coconut milk nearly to the boil with 50ml coconut cream. Poured the hot milk onto the egg mixture and whisked thoroughly. Poured the whole lot back into the pan and stirred over a low heat until the mixture was thick and just starting to bubble. Took off the heat and stirred in 50g unsalted butter. Stirred until all incorporated and the custard was smooth. Combined 300ml (was meant to be 500ml, but I had misread recipe and didn’t buy enough) with 100ml coconut cream (not in the recipe), 1 tbsp icing sugar (meant to be 50g), 1/2 tsp vanilla extract and 1 tbsp orange rum (meant to be a shot of malibu, but I didn’t have any of that either). Whipped until peak forming stage. Toasted a handful of coconut flakes in the oven for a few minutes until crisp but not burnt (rather overdid mine, but they were still delicious). Melted 50g 38% milk chocolate in a bowl over hot water. Whisked the cold custard then divided between the two tart cases. Spooned the cream over the top. Scattered over the coconut flakes. Tried to drizzle the chocolate over the top, but as it didn’t melt properly (I invariable have problems with melting milk chocolate), I soft of dolloped rather than drizzled! Looking nothing like the elegant creation depicted in the book, this was nonetheless delicious, or as CT said, ambrosial. It was all about the cream and coconut, the sweetest thing being the chocolate. It had a great mix of textures with the chewiness of flaked coconut, the crunchy biscuit base and the smooth cream. The overall effect was of a very light dessert, but very moreish. Even without the coconut extract and malibu, it tasted very coconutty. Unfortunately, it was as I feared and the base was way too crumbly as it didn’t have enough butter to hold the mixture together. This combined with the soft custard & cream meant I had to spoon the mixture into bowls rather than cut a slice and serve on a plate. All in all, I wasn’t very impressed with Bea’s recipe writing skills, but I was impressed with her concept and ultimately taste will always win out over presentation with me. Nice antidote to all that We Should Cocoa healthiness! Thank you Dom. Sweet pastries and breads is the challenge for Teatime Treats this month set by Karen of Lavender and Lovage. This event is co-hosted by Kate of What Kate Baked. I thought I had a sweet tooth, but you should see what these two get for tea! I was going to enter the cinnamon and chocolate buns I made for this tea party back in the summer, but still haven’t posted. But then I picked up my copy of Short & Sweet and there was no looking back. Dan’s top tea cakes were just crying to be made; not only did they use loads of peel (and I had quite a lot of my candied lemon and orange peel to use up), but they also had chocolate in them. Chocolate? Really? Well, you could of course use beef dripping, but if you’re a vegetarian like me, you can, according to Dan, substitute this with a good quality white chocolate as the cocoa butter gives a softer consistency to the crumb than would butter. It all sounded rather intriguing and I was keen to try it out. I sort of followed Dan’s recipe, which you can see here, but I used half bread flour and half wholemeal. I also only used 50g currants and I added 150g fresh cranberries cut in half. I used G&B white chocolate and my own mixed peel – which I cut into pieces with a pair of scissors. I found this rather a lengthy and faffy process and I wasn’t at all enthused by the stickiness of the dough which I found quite hard to work with. I was also rather upset that the tops got burnt, if making these again, I would not bake them at such a high temperature. But I have to say these were the BEST tea cakes I’ve ever eaten. They were also huge. I divided the dough into ten pieces rather than the nine that Dan had stated and they were still massive. This of course was by no means a bad thing, but twelve or a baker’s dozen would have produced a more reasonable size. So what made them so good? The combination of tangy citrus peel &amp, the tartness of cranberries and the balancing sweetness of the teacake itself. The crumb was deliciously soft just as Dan had promised. CT hates mixed peel, but he loved these tea cakes slathered in butter stating they were possibly the ultimate comfort food. This was one of the first #shortandtweet challenges, which I now wish I’d done along with everyone else. I shamelessly called for help when I was having problems folding the very sticky dough. You can see the round-up here and get an idea of what better ones than mine might look like. I’m also entering this into Ren’s commendable Simple and in Season blog event, which is something I thoroughly approve of. Do check out her blog Ren Behan, a title which represents her blog’s contents very well. Much as I try fight it, I am irresistibly drawn into bookshops if ever I’m passing one, especially into the cooking section. On one such occasion, I was flicking through the rather gorgeous copy of British Baking by Peyton and Byrne when I came across a recipe for Strawberry Jam Fairy Cakes; the picture was just too scrumptious and I not only had to buy the book but I had to make these cakes at the earliest opportunity. I have to confess, I created the opportunity myself by choosing strawberries for this month’s We Should Cocoa. However, it was also the recipe for Strawberry Jam Icing which drew my attention. It used the Italian meringue method of making the buutercream and although I’d promised myself to have a go at this, I still hadn’t managed it. The only change I made to the fairy cake recipe was to add some white chocolate and use less sugar to compensate for the additional sweetness in the chocolate. Oh yes, I also used vanilla sugar and vanilla white chocolate instead of the vanilla extract. For the icing, I halved the recipe as it seemed as though there would be way too much. I was all ready with some beautiful Cornish strawberries, a jar of a friend’s strawberry jam and some pink fairy cake cases. Melted 50g white chocolate in a bowl over hot water and left to cool slightly. Creamed 100g unsalted butter with 100g vanilla sugar until pale and fluffy. Sifted in 150g flour (1/2 wholemeal, 1/2 white) and 3/4 tsp baking powder. Stirred in 2 tbsp Greek yogurt and 2 tbsp strawberry jam. Spooned into 13 cupcake cases (meant to be 12, but I had a bit too much mixture) and baked at 180C for 15 mins. This wasn’t actually long enough for six on the bottom shelf – they sank. I put them back in for another 5 mins, but it was too late by then. Whisked 1 large egg white (duck egg in my case) with 75g caster sugar over a bowl of hot water until the sugar had dissolved and the mixture was thick (about 8 mins). Took of the heat and continued to whisk with a balloon whisk until the bowl was cold and my arm couldn’t stand it any more. By this point the soft peak stage was meat to have been achieved. Mine was thick, but still a bit runny. I gave up hoping it would all come right in the end! Whisked in 80g very soft butter, bit by bit, ensuring all was incorporated before adding the next bit. Stirred in 2 large mashed strawberries and 2 tbsp strawberry jam. Placed in the fridge and crossed fingers the mixture would firm up. It didn’t. Luckily, when I related my tale of woe to CT when he arrived home that evening, he managed to talk me into whisking it all again with the electric beater; this time the mixture came together enough to stay on top of the cakes. Oh, I had such high hopes for these and oh I was so disappointed! First off the cakes on the bottom shelf sank. Then when I turned them out, the specially chosen pink papers pulled away making the cakes look shrivelled and messy. My icing was runny and the day was so dark I couldn’t take any decent photographs anyway. Now the question is, do I blame Peyton and Byrne or do I just try to make them again using different cases and cooking them a little longer? The icing? I really don’t know, it’s the sort of thing I’d like to see someone doing to be convinced it could really work. However, in the end, I managed to get five fairy cakes looking reasonable enough to take to friends that evening, where we’d been invited over for supper. And I have to say, both slightly underdone cake and rather runny icing both tasted extremely good, delicious even. The flavour of the strawberries was very much present in both cake and icing and the white chocolate added a certain touch of unctuousness. They may be a little on the sweet side, but they are the sort of cakes where this seems highly appropriate. It’s rare for me to post something so close to the day I’ve actually made it, as I seem to have a permanent backlog, but this one has jumped the queue as time is running out. I’ve been admiring Battenberg cakes I’ve seen on various blog sites for a while, but I’ve managed to ignore the urge to make one until now. To be honest, I was a little nervous and suspected it might be beyond my capabilities. With this month’s We Should Cocoa challenge being marzipan, it seemed like I should stop wimping out and give this rather gorgeous looking retro cake a try. Of course, I wasn’t interested in making the traditional pink and yellow version, oh no, I wanted something a little different and it had to contain chocolate of course. I’m also a fan of using matcha with chocolate, so decided to use up the last of the Vitalife matcha sample I was sent a few months ago. As my base I used the recipe from Fiona Cairns’ Bake & Decorate. As it was for We Should Cocoa and also for an Easter tea with friends, I thought I ought to make my own marzipan. I had a look at the ingredients on some commercial marzipan and that sealed the deal for me: only 24% almonds compared to my 60%, the rest of it was sugar. In the back of my mind, however, I had a vague memory of struggling with my last attempt at marzipan which was crumbly and difficult to roll. Mixed 175g ground almonds with 100g icing sugar. Made a well in the centre and added 1 duck egg yolk, 3 tsp lemon juice, 3 drops of almond essence and a splash of water. Mixed initially with a spoon then brought together with my hands to form a ball. Sifted 200g flour (1/2 wholemeal spelt and 1/2 white) into a bowl with 1 rounded tsp of baking powder. Added 200g natural granulated sugar, 200g softened unsalted butter (cubed) and 3 duck eggs. Beat together with a hand held mixer. Added a large tbsp Greek yogurt and beat some more. Spooned half of the mixture into another bowl. Added 2 tsp matcha to one bowl and 3 tsp cocoa to the other bowl and mixed. Spooned mixtures into a 9″ (23 cm) square cake mould using a piece of upright baking paper as a divider down the middle. Baked at 180C for 20 minutes until risen and firm to the touch. Then proceeded to spend an inordinate amount of time making a mess. Trimmed the cake and cut into 4 equal rectangles of 4.5 x 21 cm. Warmed some of my marrow and ginger jam, which was already quite runny. Brushed this over the cake pieces and “glued” them together to form a rectangle with alternate colour segments. Rolled out the marzipan to a size I thought would cover the cake. This is where I really came a cropper as the marzipan just cracked and wouldn’t hold together. Brushed the outside of the cake rectangle with more jam and tried to wrap the pieces of marzipan around the edge. Made these truffles with the leftover cake. How right I was to doubt the marzipan! Still, although this cake may not have looked quite as I’d envisaged or hoped, it was most certainly delicious. The cake was firm but moist and the two flavours complemented each other nicely (I did try the trimmings). Both the cocoa and the matcha flavours were present, but neither dominated. The marzipan may have been crumbly, but it tasted delicious. It was almondy, of course, but not overpoweringly so and certainly not overly sweet. This cake has yet to be tasted by anyone else, but I’m feeling fairly confident that it will be enjoyed later on today, crumbling and cracked marzipan notwithstanding. If it hadn’t been for the We Should Cocoa challenge, I would never have made this cake. I’m not sure I’m likely to make it again, either. If I do, I’ll use bought marzipan, unless someone out there can explain the arcane mysteries of successful, pliable marzipan to me. PS Now back from moorland tea party. The Battenberg was enjoyed by all as part of a sumptuous spread. Perhaps I’m a little sad, but I do get quite excited as I await with anticipation to find out what Chele will choose when it’s her turn for We Should Cocoa. This month, she’s come up with a corker: lime, one of my favourite flavours. So many choices – should I do lime and dark chocolate tarts, my old favourite cheesecake or …..? In the end I adapted a recipe from my newest acquisition; I really must stop browsing in book shops, it does my purse and book shelves no good at all! Not having a television, I don’t get to see many cookery programmes. However, I was lured by Craig of We Grow Our Own and Mark McKellier to watch Lorraine Pascale’s, Baking Made Easy on iPlayer. I watched the whole lot and made a couple of the recipes with excellent results. So, when I happened to see her book on sale, I just couldn’t resist. Simmered 2.5 oz of light muscovado sugar with 1 fl oz water, 1 fl oz grapa (meant to be rum, but I didn’t have any of that) and the juice from the lime for about three minutes until syrup slightly thickened. Took off the heat, added the lime zest and a couple of sprigs of mint (just about showing in the garden). Put the lid on the pan and left to infuse. Buttered the sides and lined the bottom of a 19cm spring form tin (I didn’t have a small enough or deep enough silicone mould or I would have used that). Melted 4oz unsalted butter and left to cool a little. Placed a mixing bowl over a pan of hot water and beat 6 eggs (2 duck + 4 chicken) and 9oz caster sugar together with electric beaters for a good five minutes. Took the bowl off the pan and continued to beat for a further few minutes until the mixture was pale and thick and had more than tripled in volume. Poured the butter down the side of the cake bowl so as not to deflate the eggs and folded it in as gently as I could. Folded in 9oz sifted flour (6oz white, 3oz wholemeal) again as lightly as I could. Poured the mixture into the tin and baked at 180C for 40 minutes, covering the top of the tin with foil for the last 10 minutes so as not to brown the top too much. Melted 100g white chocolate (G&B). Creamed 3 oz unsalted butter with 4oz icing sugar and the zest from a further lime until all well incorporated. Beat in the juice from half a lime. Cut the cake in half and liberally brushed each cut side with the syrup. Spread some of the buttercream over one side and placed the other side on top so that the cut edges were sandwiched back together again. Spread the rest of the buttercream over the top of the cake and around the sides. Decorated with wafer daisies as spring was in the air. This cake was decidedly on the faffy side, but well worth the effort. The syrup smelt divine and scented the whole house for hours. The cake rose beautifully and cut easily without leaving too many crumbs. 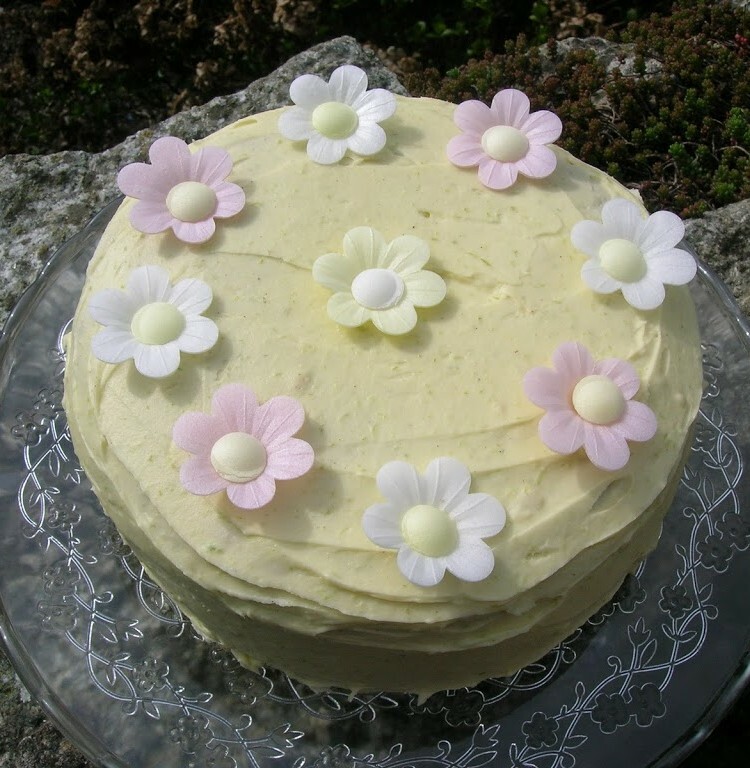 I loved the colour of the green tinged buttercream which, thanks to the lime, was divine. Despite not being fond of overly sweet confections I could quite easily have eaten the whole bowl. Wisely I restrained myself. The cake itself was delicious and the lime syrup was worth the extra effort – watch out lemon drizzle cake! It was the last day of my holidays and having seen the lovely scones created by two of my favourite food bloggers Kath of The Ordinary Cook and MangoCheeks of Allotment 2 Kitchen, I sort of thought it would be nice to invite some friends over for tea. Scones, cake and tea, what could be better? 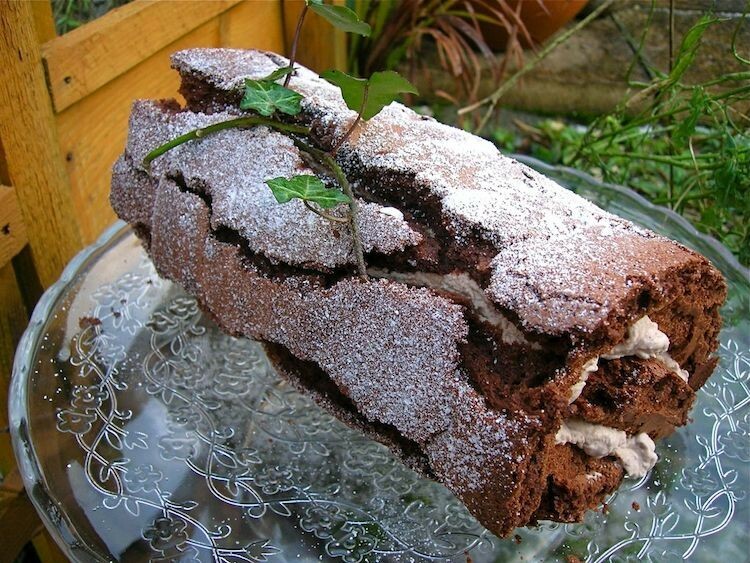 A chocolate log blog without a chocolate log recipe? With the Christmas season in full swing, pressure has been mounting to correct this omission. What to bake? Actually, it wasn’t that difficult, a recipe I’ve been wanting to try has been lurking in my pile of dusty magazines & cuttings since 2005 – better late than never! It’s a chocolate chestnut roulade from I’m no longer sure where. The house is smelling wonderfully of roasted hazelnuts – mmmmm! It’s another friend’s significant birthday and there is a party to celebrate it tomorrow, so I have just cooked what smells like a really delicious cake. As it is the time of mellow fruitfulness and the time of apples and hazelnuts in particular, this seems like an appropriate time to make this cake from Green & Black’s. Trouble is, I want to try it now! Roasted 4oz of hazelnuts in hot oven for 10 mins. After skinning them (rubbed them between my hands and skins came off very easily) ground them roughly in a coffee grinder. Reserved a handful of whole ones for decoration. Creamed 10oz unsalted butter with 6oz unrefined brown sugar until quite pale. Beat in 3 duck eggs alternately with 10oz sifted flour (5oz wholemeal + 5oz white spelt) and 3 tsp baking powder. Mixed in 5 tbsp coffee. Finally stirred in hazelnuts and 2oz grated 85% chocolate. Divided mixture between two 21cm round tins (well, silicone thingies really) and baked at 180°C (gas 4) for 35 minutes until firm. Hey ho, the best laid plans! One of the baking trays I put my sandwich thingies on was warped so I ended up with a rather lop sided cake which meant that the ganache went merrily rolling down hill and over the edge in a great chocolate waterfall. I also had trouble with my ganache, which separated and refused to behave so I had to rescue it with some icing sugar. Peeled and chopped 1.5 lb apples (original recipe stated Bramley – I used 1/2 Cornish Gillyflower and 1/2 Cornish unidentified). Simmered this with juice and grated zest of 1 lemon and 2 tbsp unrefined granulated sugar until apple soft but not too mushy. When cool used to sandwich cakes. Melted 5oz 85% chocolate with 125 ml whipping cream and 1 tbsp grappa. When tried to stir this, mixture curdled so added about 2 tbsp icing sugar which luckily sorted the problem out. 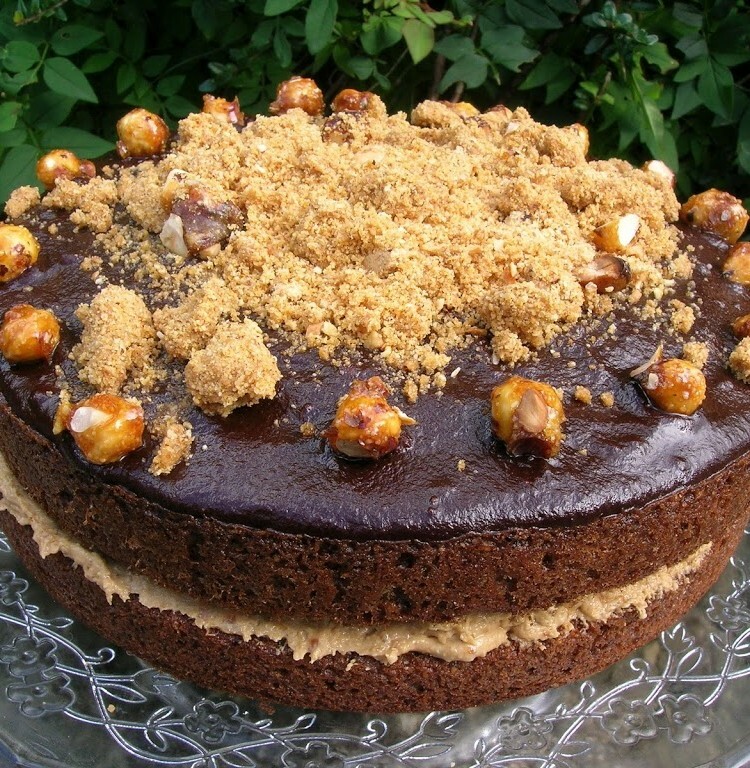 When cooled, poured this over top of cake and decorated with reserved hazelnuts and chocolate shavings. Despite its rather interesting angle and the pool of chocolate down one side, I’m glad to report that the cake was a success. The hazelnuts really made it quite scrumptious. The apple filling was also a delicious addition and its fruity tartness complemented the chocolate really well. The next time I make this, however, I shall give it a few minutes less in the oven as it was a little on the dry side.